Home › Uncategorized › It's almost time for "May"keover Month! 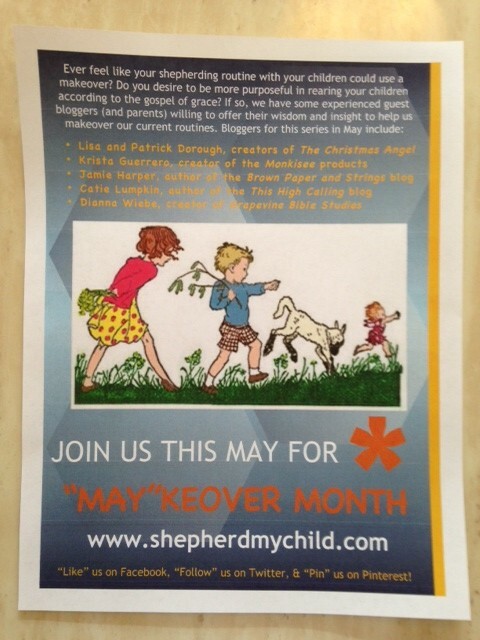 It’s almost time for “May”keover Month! I looked at the calendar this morning and realized that, besides being tax day, it’s also the half-way point of April, which means we are just a few weeks away from the start of “May”keover Month! So what exactly is “May”keover Month, you ask? 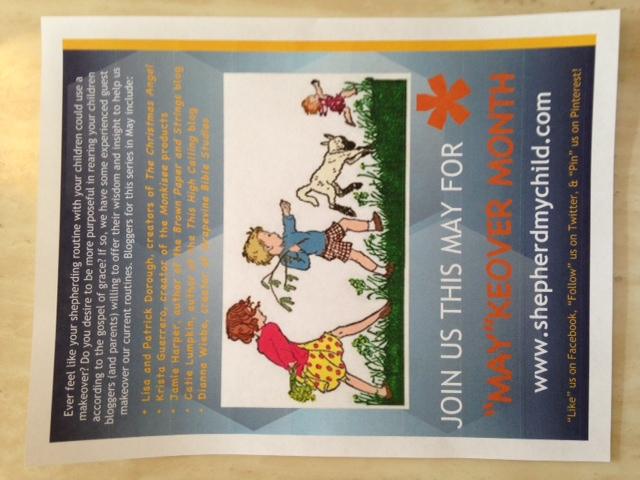 “May”keover Month is a series of posts by guest bloggers on the Shepherd My Child site aimed at helping caretakers become more “purposeful” or “deliberate” in their shepherding routine. May seems like a good time to run this series as many of you are probably doing some “spring cleaning” and reorganizing around the house. While we’re focusing on organizing the physical things around us, we can also become more organized or “purposeful” with the spiritual as well! Also, with most children finishing school by the end of May, the summer months provide more time to think about changing up routines and seem to offer us more flexibility in implementing some of the suggestions by our guest bloggers. Speaking of guest bloggers, I am so excited about the guest bloggers who are participating in this series! The series will be kicked off by Krista Guerrero, CEO of Intellectual Baby and the creator of the Monkisee products. She has already sent me a draft of her post and it is wonderful! There are so many insightful points and suggestions on (“May”king Yourself a Deliberate Parent – title of her article). It’s sure to be a great month! Make sure you spread the word to anyone you think might benefit from or appreciate this series! We’re just a few short weeks away!